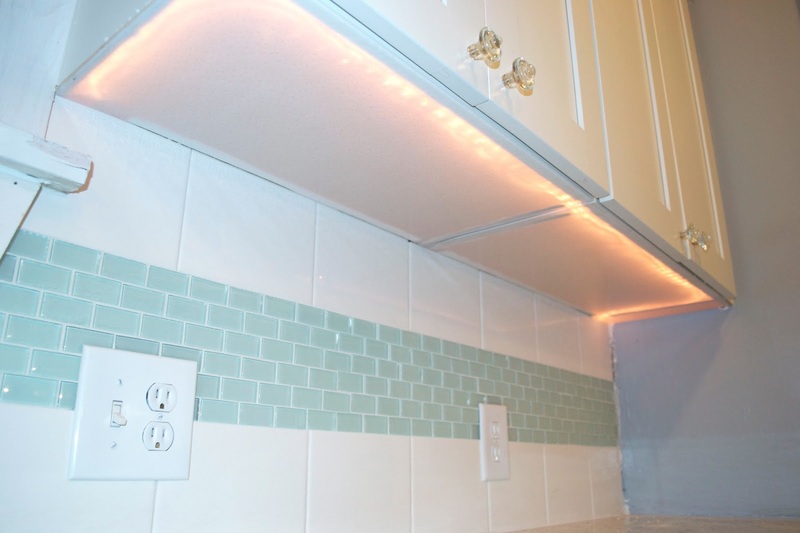 You may recall that we added a lot of accent lighting to our kitchen including rope lights on the underside of the cabinets. While we love the extra light and our special light switch for them which allows them to be on a timer (we are especially loving this when we have to get up in the middle of the night for Will and we don't have to turn on the bright lights or hunt around for a light switch) we weren't loving how the underside of the cabinets were looking. Not only were they not white, but seeing the gaps between the cabinets was less than appealing. To cover the bottoms of the cabinets up and still have light required a transparent material. After thinking through some different ideas, we landed on ceiling light panels. 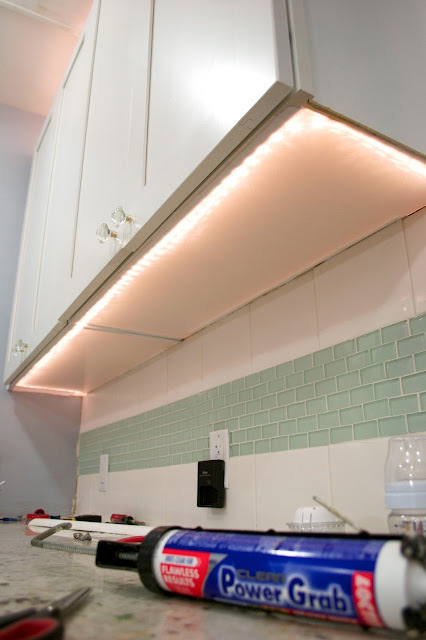 The pro's for these panels were that they are made to allow light through but to diffuse it and they can be cut with a utility knife. They are also light weight and they come in the perfect width to be cut in half and perfectly fit the bottom of a cabinet. The only con is that they are brittle so if you're not careful, you can break off pieces, especially corners (see below). 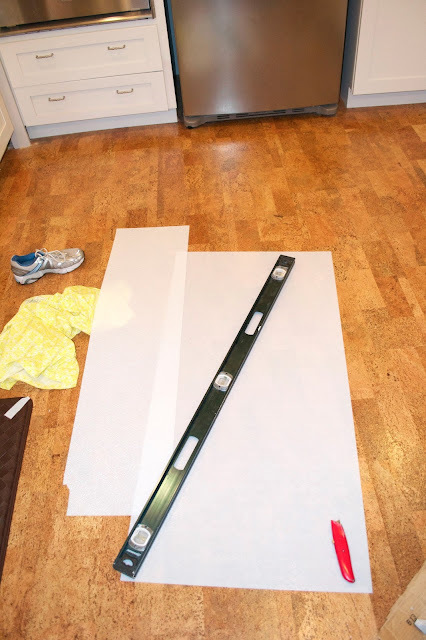 We used our long level as a straightedge to get a nice even line to cut the panels in half. 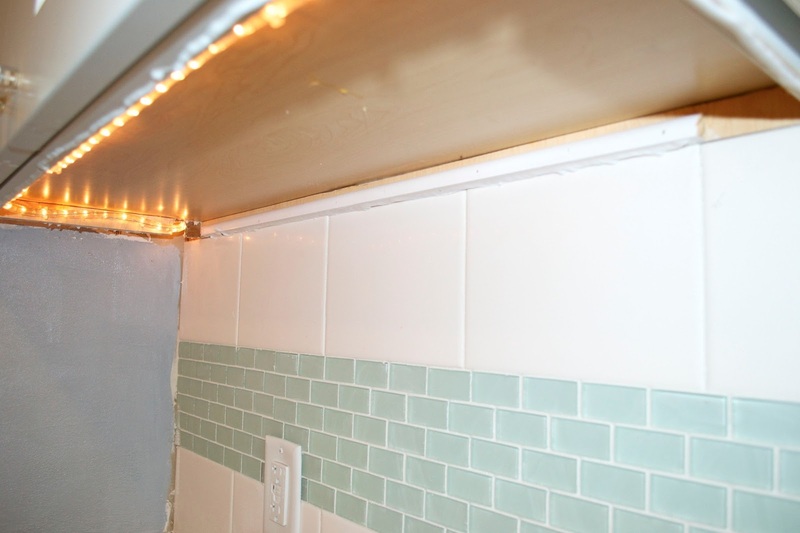 Since the panels are light weight and brittle, we decided glueing was the best option for putting these bad boys up. 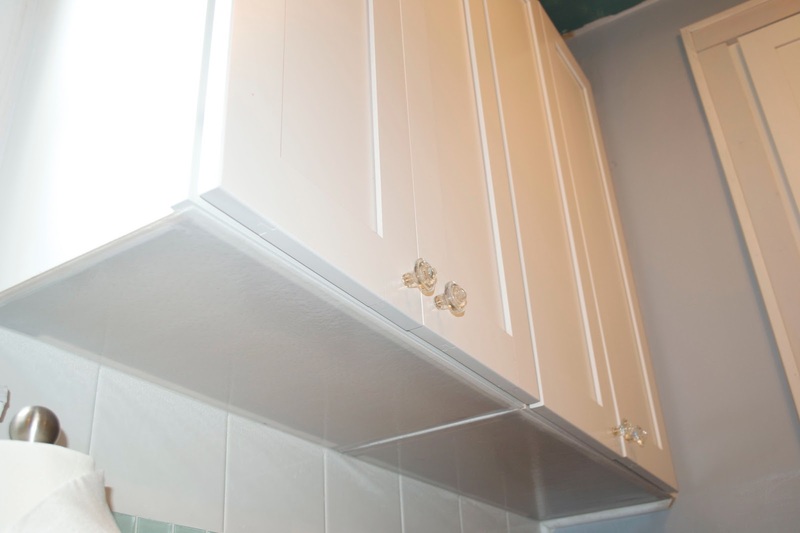 To make sure the back edge was attached well, we added an extra piece of trim to the back of the cabinet. 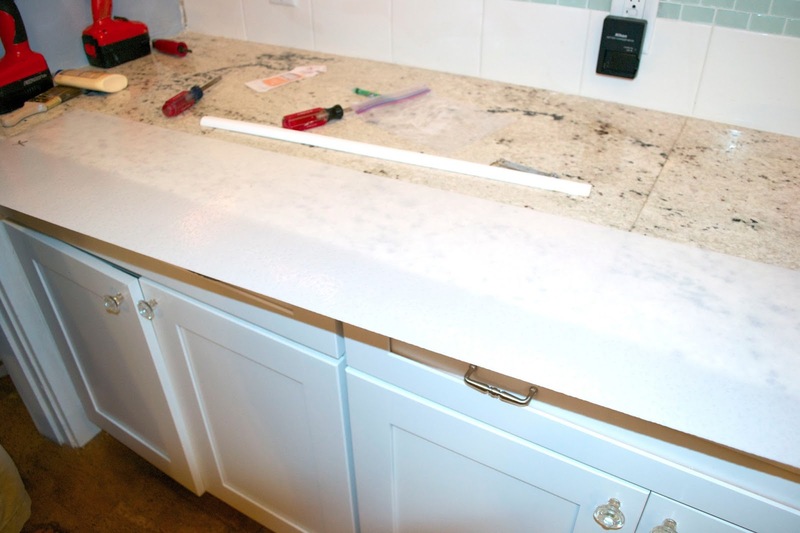 Then we put a bead of Loctite construction adhesive around the entire bottom edge of the cabinet and pressed the panel into place. We used the Loctite adhesive since it dries fast and is extremely strong (and this version can be cleaned up with water if you get it somewhere you don't want it). After holding the panel in place for a few seconds we had one panel up. Here's one cabinet with half the panels up so you can see the huge improvement. We then repeated the process for the rest of the cabinets. With the lights on you can still see the glow of the rope light but with the lights off you would never know they were there. Once everything was up we added caulk around all the edges and trim near the wall. 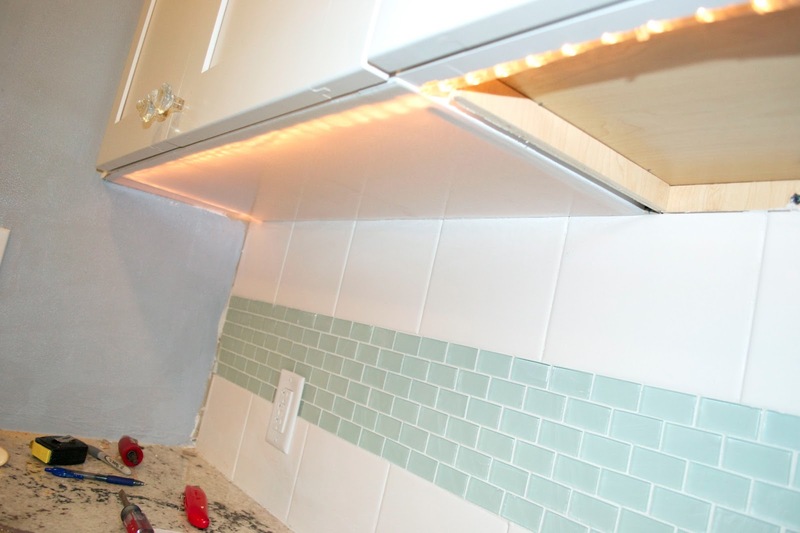 Another great feature is that while the glue is strong, you can pop off the panel if needed (like if we want to change the lights). We found this out after we put one panel on upside down. 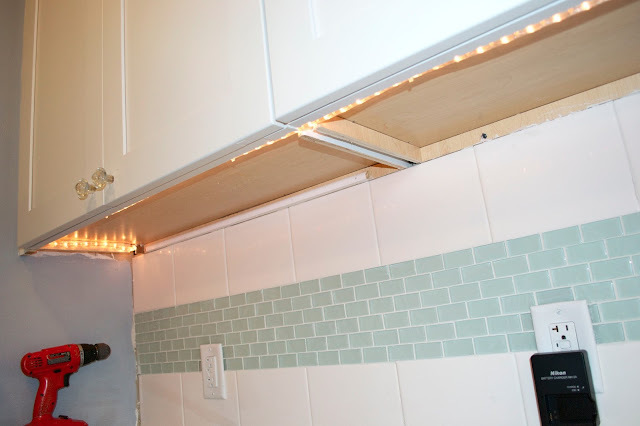 Now if you are a child/extremely short/just like look at the bottom of people's cabinets, you will see nice white bottoms instead of brown with black screws and ugly gaps. 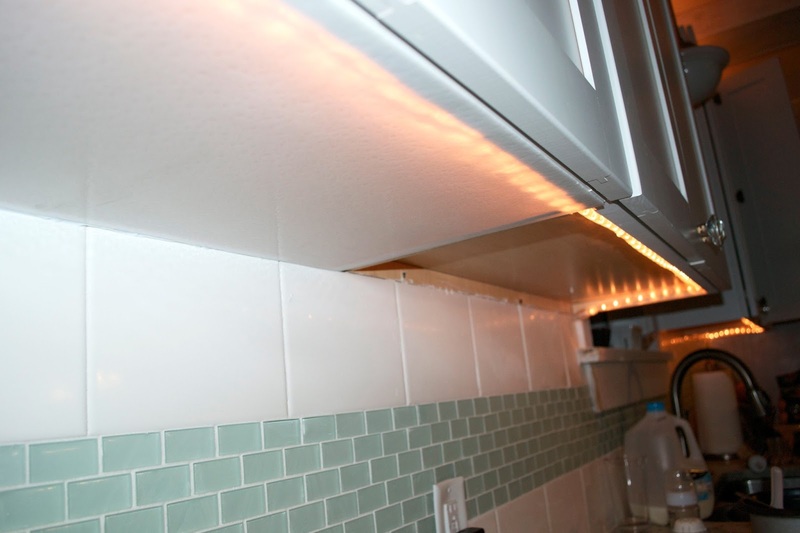 I bet you love having the lights under the cabinetry too. Great Job Cassandra! You were this week's favorite from catch as catch can, but I was unable to snag your picture. :( If you want, you can email it to me and I'll put it up on the post.